The Milky Way's Supermassive Black Hole may soon devour much of an approaching cloud of dust and gas known as G2. A supercomputer simulation suggests that some of G2 will survive, although its surviving mass will be torn apart, leaving it with a different shape and questionable fate. But it won't be a collision course. The point at which a stellar object can no longer escape being swallowed by a black hole is known as the Schwarzschild radius, a quantity whose value depends on the black hole's mass, the speed of light and the gravitational constant. The cloud will actually pass far enough away that it will escape the point of no return by approximately 2,200 Schwarzschild radii, which in this case is about 200 times as far as Earth is from the sun. But the supercomputer simulations show that the cloud will not survive the encounter. "There's too much dynamical friction that it experiences through hydrodynamic instabilities and tidal stretching from the black hole, said physicist Peter Anninos of Lawrence Livermore National Labs. "So a lot of its kinetic energy and angular momentum will be dissipated away and it will just sort of break up into some sort of incoherent structure. Much of it will join the rest of the hot accretion disk around the black hole, or just fall and get captured by the black hole. It will lose a lot of its energy but not all of it. It will become so diffuse that it's unlikely that any remnant of the gas will continue on its orbital track." The black hole is known as Sgr A*. "Sgr" is the abbreviation for Sagittarius, the constellation near the center of the Milky Way. Most galaxies have a black hole at their center, some thousands of times bigger than this one. "While this one is 3-to-4 million times as big as our sun, it has been relatively quiet," according to astrophysicist Stephen Murray also of LLNL. "It's not getting fed very much." Contrary to their name, black holes can appear very bright. That's because gas orbiting them loses energy via friction, getting hotter and brighter as it spirals inward before falling into the black hole. The composition of the G2 cloud is still a mystery. Astronomers originally noticed something in the region in 2002, but the first detailed determinations of its size and orbit came only this year. The dust in the cloud has been measured at about 550 degrees Kelvin, approximately twice as hot as the surface temperature on Earth. The gas, mostly hydrogen, is about 10,000 degrees Kelvin, or almost twice as hot as the surface of the sun. Its origin is still unknown. The findings are the work of computational Anninos and Murray, both of Lawrence Livermore National Labratory, along with Chris Fragile, now an associate professor at the College of Charleston in South Carolina.They came up with six simulations, using the Cosmos++ computer code developed by Anninos and Fragile, which required more than 50,000 computing hours on 3,000 processors on the Palmetto supercomputer at Clemson University in Columbia, South Carolina. 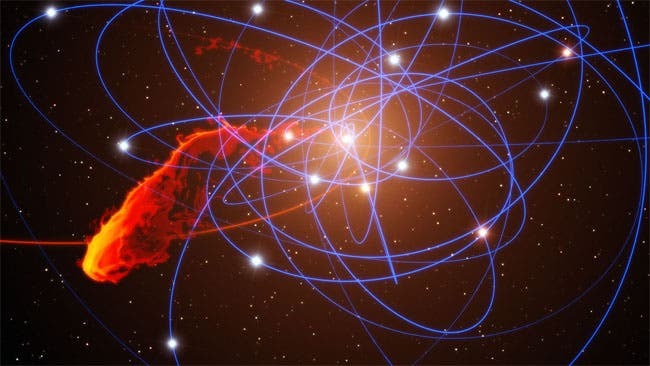 Previous simulations of the upcoming event had been done in two-dimensions, but the Cosmos++ code includes 3D capability, as well as a unique "moving mesh" enhancement, allowing the simulation to more-efficiently follow the cloud's progression toward the black hole. "The speculation ranges from it having been an old star that had kind of a burp and lost some of its outer atmosphere, to something that was trying to be a planet and couldn't quite manage it because the environment was too hot," said Murray. 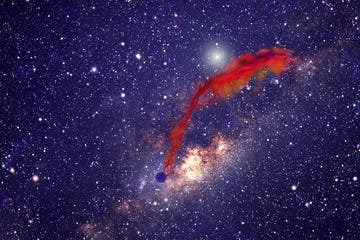 As the cloud approaches the black hole and begins to fall in to what Murray describes as "a gravity well" beginning next September, it will begin to shed energy, causing it to heat to incredibly high temperatures, visible to radio and X-ray telescopes on Earth as well as orbiting satellites such as NASA's Chandra X-ray Observatory. By the end of 2012, the cloud will be nearly five times longer than it is wide. Along with tidal stretching, the cloud also experiences resistance in the form of ram pressure as it tries to plow through the hot interstellar gas that already fills the space around Sgr A*. The interactions of G2 with this background gas cause further disruptions to the cloud from Rayleigh-Taylor and Kelvin-Helmholtz instabilities. Collectively, these effects act to strip some material from the cloud and feed it into Sgr A*. For more information: An article describing the simulation research will appear in an upcoming issue of the Astrophysical Journal. Journal reference: Astrophysical Journal.